All players should be moving during this exercise. Once the first player reach cone next player should go. Players need to get used to moving/dribbling with traffic around them. Be Okay with the players runnning into each other, give them time to figure it out. Stop and correct if completly needed. This should be played for time (make a game of it!). For example: how many times can your team dribble around the cones in 1 min. Losing teams should have to do something to get stronger (i.e. push ups). 1. Dribble to last cone turn to go back to line, at middle cone make pass to next player in line. 2. 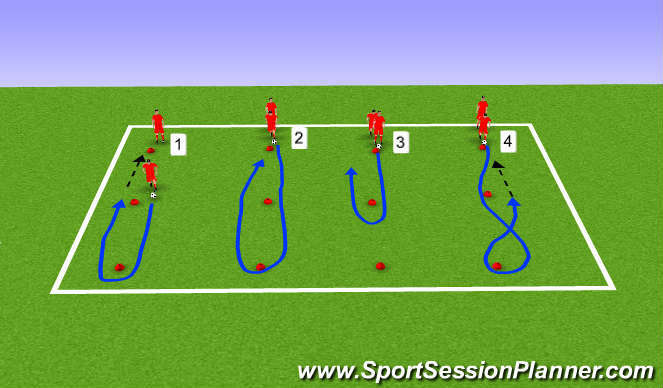 Dribble around both cones and dribble ball to next play in line. - players waiting in line should be in plank position while waiting for ball to be returned. 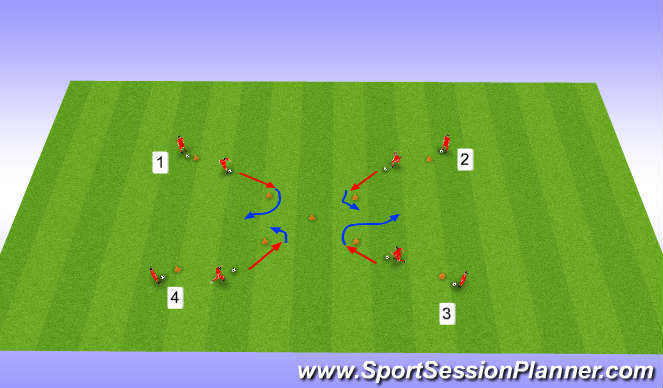 3. dribble around first cone and dribble to next player in line. - five toe touches should be done before next player leaves with ball. 4. dribble around cone to create figure 8, when returning to center cone pass to next player in line. - players waiting in line are again in push up position with head up (remind players while in push up position with head up they also need to keep head up when playing so they are prepared to receive ball - game relation). Set up: four goals (two for blue team, two for red team). -two balls will be in play at all times. - game is played for 3 min. or until all balls are lost. 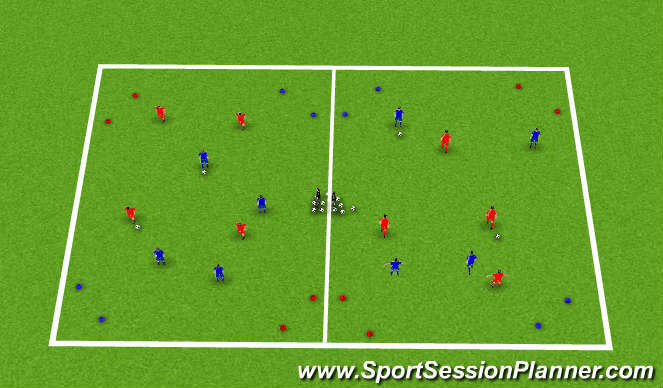 - players should keep track of each goal scored, to score players should dribble through gate. (gate should be set up away from lines to allow room for player to dribble through gate. Objective: Get players to change direction/find space. -game is played until first team scores and then other team comes on right away receiving a ball from coach. This will create transition so team that just scored has to reach and get back to defend their goal. - this game will take a lot of vocal assistance from coaches to keep waiting team alert but the expectation is they are ready to receive ball when goal is scored. - to test playes awareness on sideline games can be stopped and team waiting can be quizzed on a situation on what a player should do on field or where next pass should have been played.